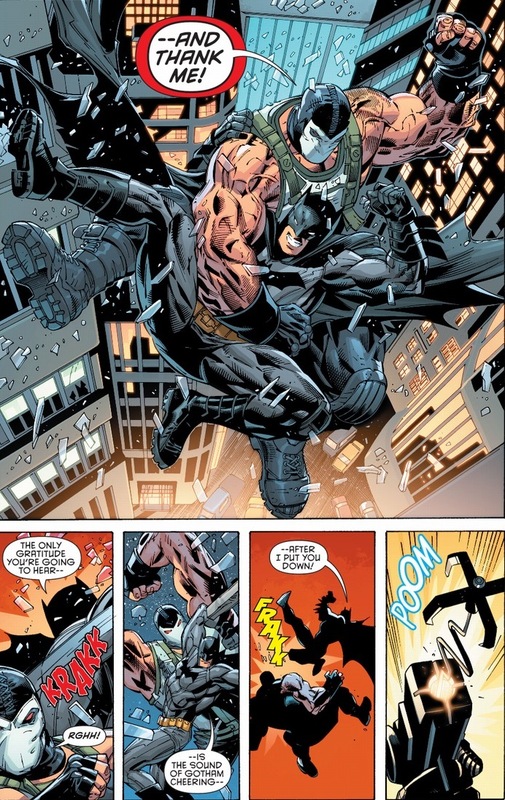 Do you enjoy Batman and Bane beating on each other but prefer the newer artistic techniques of modern day comics? Well, I’m not going to let you wallow in early ’90s self-pity. 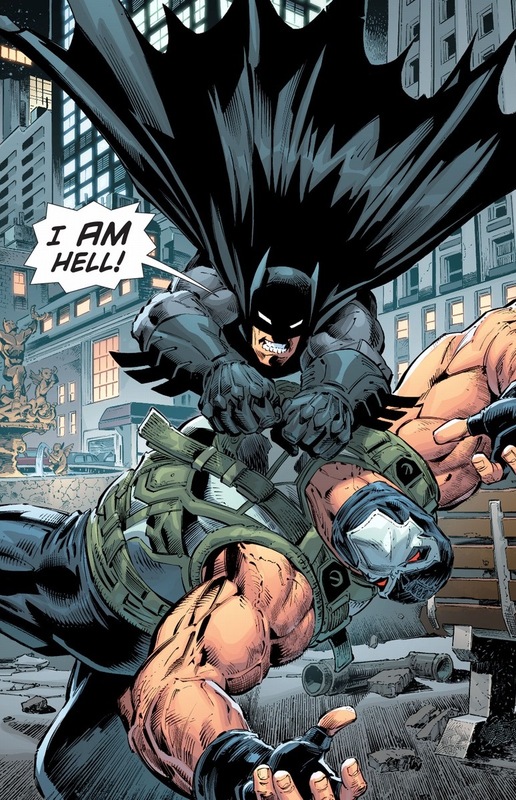 Today, we’ll cap off our five weeks of Batman-related articles (or we’ll keep going, I haven’t decided yet) with Batman and Bane’s newest battle in the responsibly titled Forever Evil Aftermath: Batman vs. Bane one-shot, written by Peter J. Tomasi and drawn by Scot Eaton. 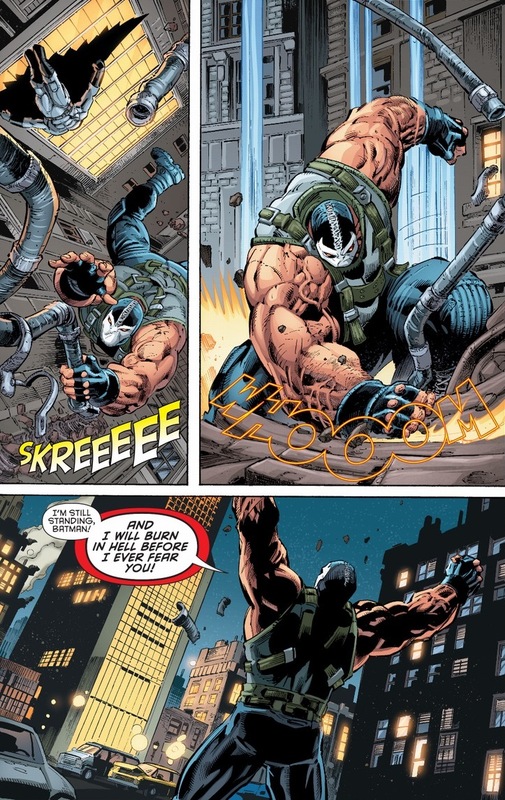 As with many things in the New 52, the venom-riddled Bane we know and love is back. No recovery, no speeches about weakness, etc. 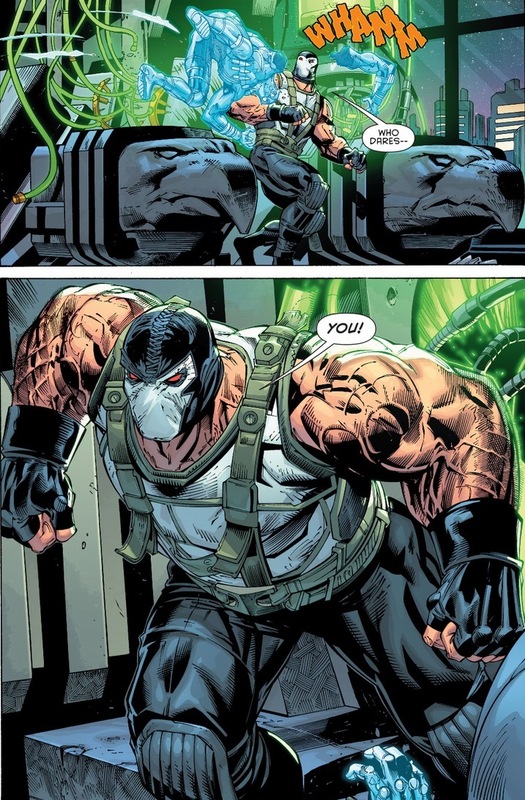 Just Bane’s veins pumped full of that delightful neon drug and a desire to pummel the Dark Knight until he has a permanent bat symbol stained on his fists. 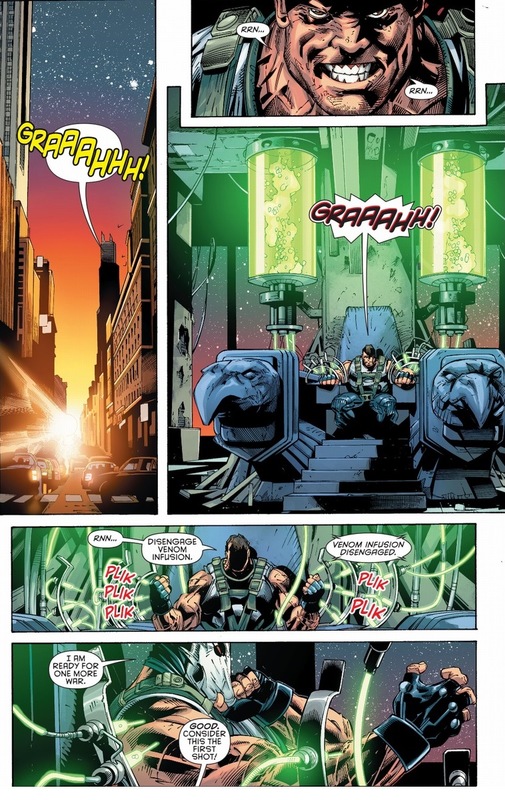 Did you read the DC event Forever Evil? All the superheroes disappeared, the Crime Syndicate (evil Justice League) took over, and the bad guys briefly won if only by default because of no good guys were around to stop them. Bane used his time wisely. He took over Gotham City. By the way, I love this issue — both speak in such grandiose terms and broad metaphors in between hitting each other with statues and stuff. I get that the venom makes Bane superpowered, but for all his bravado, even he wouldn’t survive a thirty-ish story fall onto Gotham City pavement. And he’s a large man — it’d be a lot of mess to clean up. 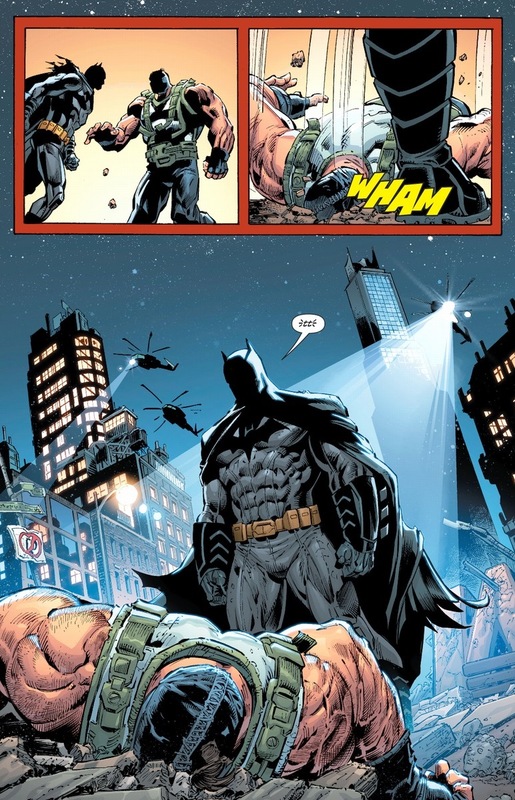 Sadly, Bane’s Kingpin of Gotham status lasts exactly until Batman shows his face again. Marvel’s Kingpin still traverses New York City with his ninja army and drug mules no matter how many times Spider-Man, Daredevil, or Punisher take him down. Hell, Daredevil and Punisher left New York months ago — the Kingpin outlasted even the superheroes. 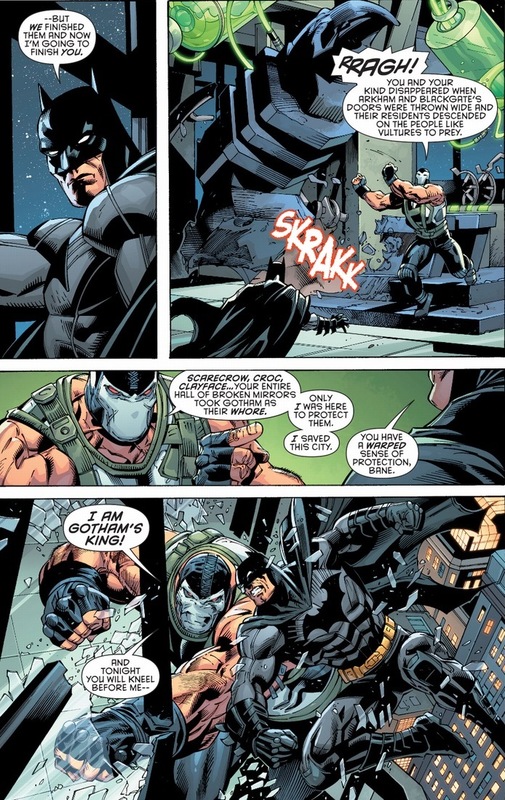 But poor Bane, because Batman’s far scarier than Spider-Man could ever be. Beautiful movie action hero line by Batman. 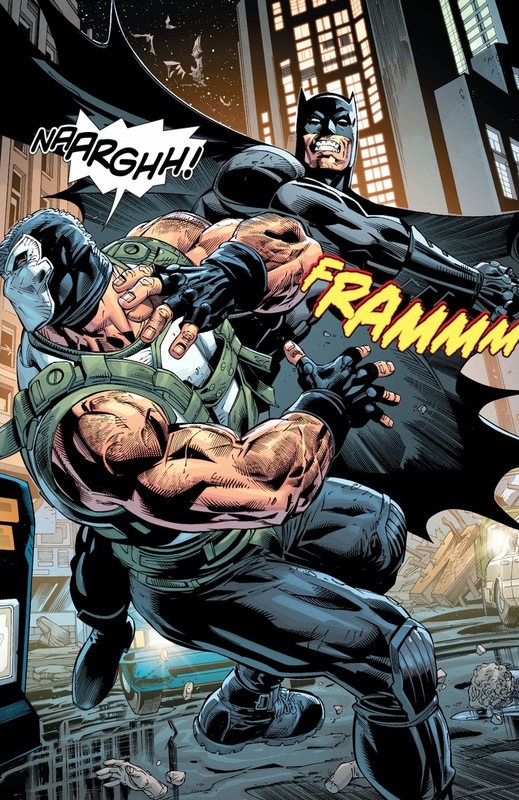 Has Bane thought about wearing sleeves or a helmet maybe? 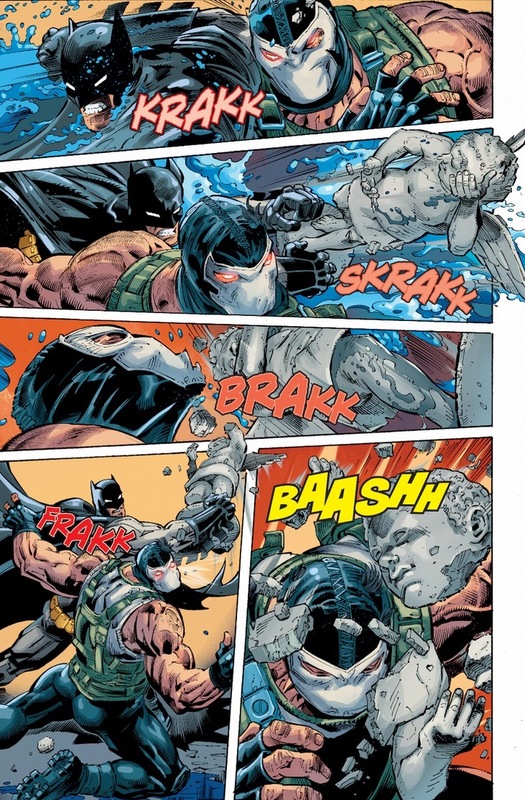 I’m no strategist, but when Batman ambushes him, he’ll almost certainly aim for the parts that aren’t protected by clothes. Batman certainly adjusted. 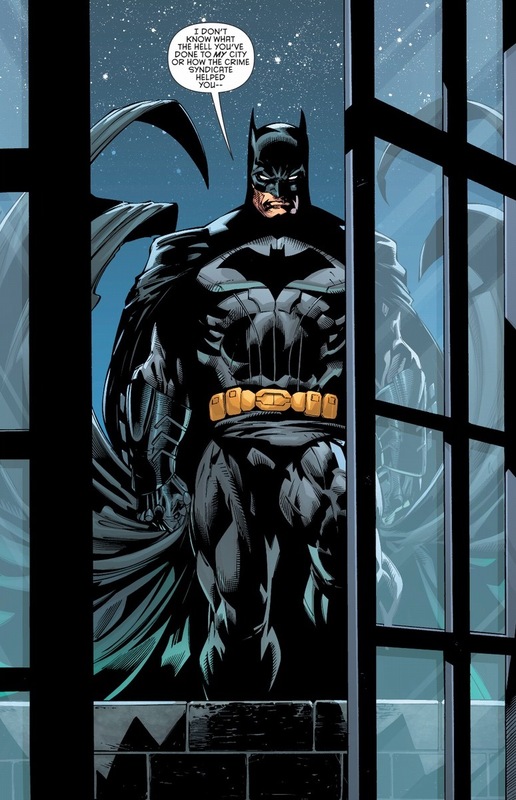 As Batman’s costume has slowly evolved into armor over the past decade or so, we accept more readily that the Dark Knight can take a hit and bounce back. 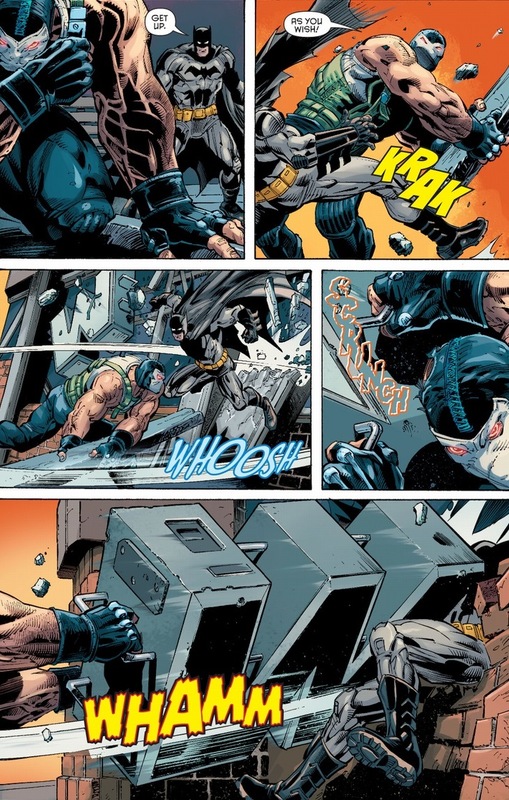 As you read these next pages, could you really see spandex Batman walking away from blows like these? Obviously Bane has to lose this fight. It’s part of the downside of being a supervillain. 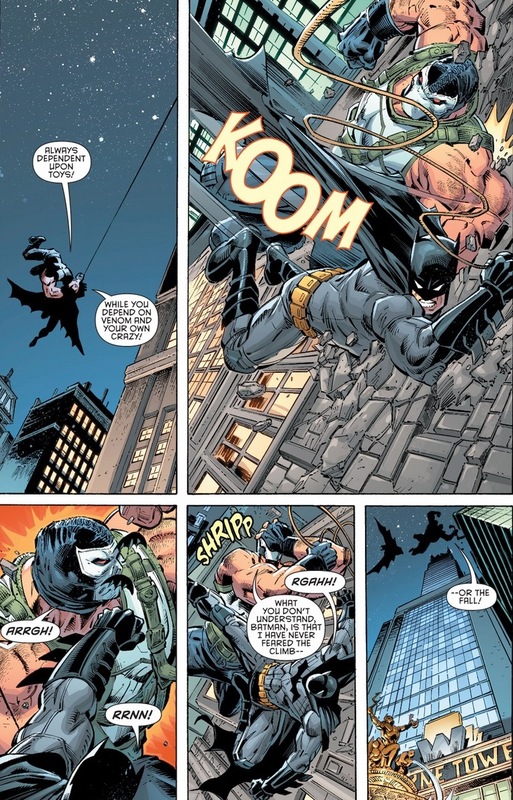 But if we can give him credit, he took a fall from a skyscraper, four batarangs, innumerable punches and kicks, and a stone child to take him down. I’m just saying the Riddler would have been out by the first batarang. 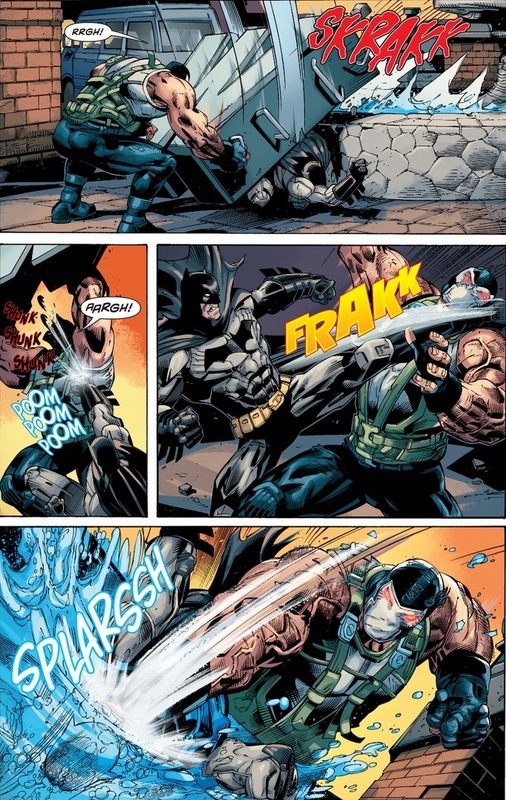 So while Bane hasn’t shown up in the New 52 since this issue, at least he went out like a man. A delusional man ranting nonsense and addicted to drugs. But still.